The Art House is a unique and valuable space which exists to bring new art into the world. We do that by taking risks, both creatively and financially. Founded as a space where artists are safe to try out new things, to perform or exhibit for the first time, to interact with the audience in a very direct way – The Art House has grown to be an inspiration for other venues, spreading a new way of doing business beyond our own city. The Art House does all of this with no outside funding for our running costs of over £188,000 per year. 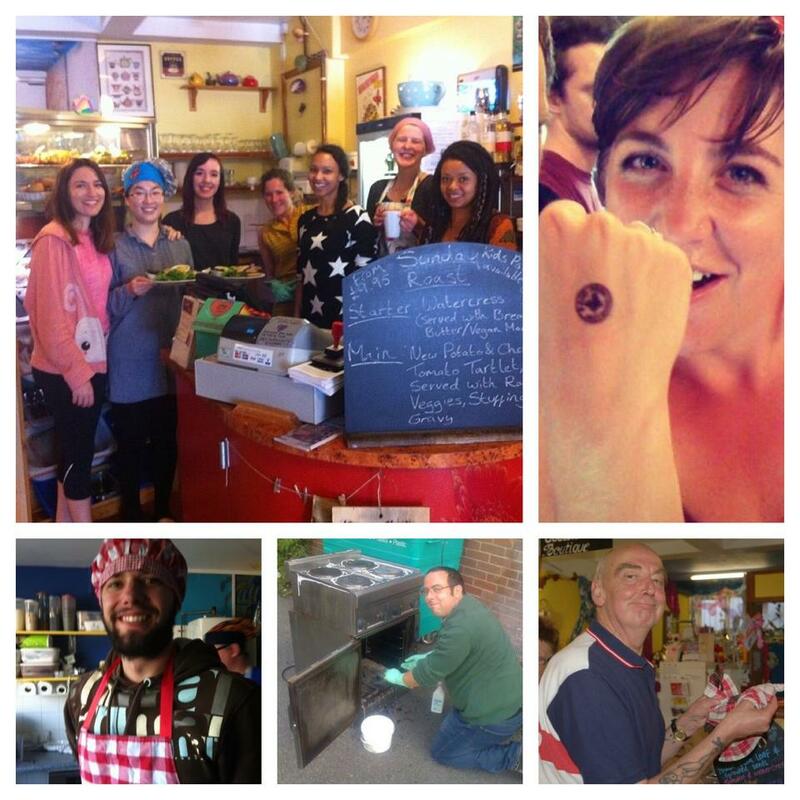 The day-to-day costs, the things which keep the space open, are met by sales in the cafe and by donations from those who support what we’re doing. We are, quite literally, a cake, love and tea-powered arts centre, funded by the people who believe in our mission and who benefit from our existence. This works really well. Most of the time. Almost all of the time. Look, let’s be honest – art and food are high-risk income sources! Independent cafes and galleries often don’t make it financially, no matter how good they are and there are always quiet times. Add to this our higher than average food and drink costs due to being committed to ethical, organic sources and we’re left with a very slim margin. Why do we need a Patrons fund? A few bad weeks caused by things we can’t control: very hot (or icy) weather, an election, roadworks or other big event in the area that disrupts normal business, an unexploded bomb up the road (yes, this actually happened) can have a serious impact on the money coming in, and when a business exists on a break-even level as we do, these slumps can get serious quite fast. Our volunteers make the whole thing possible! drink at prices that compare with other cafes in the area, whilst not externalising our costs to the detriment of people, animals or the planet. But there is still sometimes a shortfall, a shortfall which can be as much as 7% of our costs per year. But these extra activities can detract from the main reason we are here, which is to provide a year-round space for you, the community of Southampton and beyond. The up-and-down nature of our income is a challenge, it makes it hard to innovate, take risks and do new things, because there’s always the spectre of not-being-able-to-pay-the-bills looming over us. It also leaves very little room for those personal things which impact our small team. There’s also a personal reason we’ve launched this appeal right now. 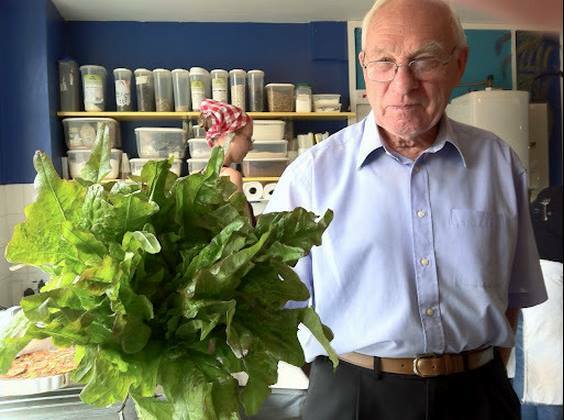 Bik’s Dad Keith has been a volunteer for four years and brings in organic produce from his allotment! At the moment, Bik, one of our directors, is supporting his Dad through cancer treatment. Both Bik and Jani are having to take days off to support him during hospital appointments, as well as wanting to spend time with him to keep him chipper…. making it hard to work as many hours on promoting what we do and planning new things. This has already had an impact on our income, despite trying to juggle all of this with our usual challenges. Look: Life stuff happens, and in a small place like ours that can mean it happens to our ability to work as hard as we usually do to keep that income flowing. We want to life-stuff-proof The Art House as much as is humanly possible, and we’d like your help. The Art House needs a bedrock, a solid foundation on which to build a stable future – and we’d like to ask you, to give you the opportunity, to be a part of this. * £5 or even £3 a month is plenty, please don’t feel it’s ‘not enough’ – it all adds up to alleviate the stress of all those bills very quickly! If you are in a position to chip in more than that, yay, but please don’t feel you’re anything less than uber generous with the fiver. We love those fivers! Seeing those donations come in each month not only helps us feel secure and supported, it gives us fresh energy, each month, to keep doing the work we do. The work we do changes lives, by letting people tell their stories, and share their creative selves. It gives people a safe place to learn, to transform, to connect with likeminded folks. We promise that, as a small organisation, we will make every penny count and deliver back so much art, joy and positivity directly to you, our community. Selecting artists because they are doing something new, sometimes a bit risky, always a little on the edge, is what we do. We love to give art a chance, regardless of whether it’s commercially viable or not. We think this is important and we’re pretty sure you do, too – and this is your way to make this happen in Southampton.